Rainbow Riches slots game is a favorite by many players. Besides the charming graphics, people like it because of the bonus games. But Barcrest understands that players want more. This is why the developers at Barcrest made a spin-off game and called it Rainbow Riches Reels of Gold slots. At first glance, it is completely different from Rainbow Riches slots. Instead of a game with just five reels, Reels of Gold slots game features an extra grid on the side. This makes the game 5×12 instead of just 5×4. Still, Rainbow Riches Reels of Gold slots game retains the theme of the original game. It’s very colorful and still has elements of Irish folklore. On these reels, you’ll see icons like 4-leaf clovers, harps, rainbows, and mushrooms. These symbols and the expanded grid makes Rainbow Riches Reels of Gold slots game another standout for Barcrest. 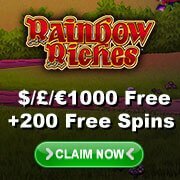 If you loved getting Rainbow riches slots free spins in previous games, Rainbow Riches Reels of Gold slots also has this feature. But this game boasts a total of seven different features. One feature is the Balloon Bonus. When you get two balloon symbols, you could tempt a fairy into adding extra symbols to the reels. This will activate the Free Spins Pick Me bonus. When you unlock the Free Spins Pick Me bonus, you can get a screen with a bunch of balloons. Then you can pick one. Inside the balloons are a certain number of free spins. Rainbow Riches Reels of Gold slots game gets more exciting with a magical fairy. When you play, she can give you different mini-features. Randomly, the fairy can wave her wand and fill up one or more reels with stacked Rainbow Riches symbols. One of her best features is the Near Miss Win feature. Here, the fairy offers a bit of help. She makes the reels shift so you can get a winning spin. And these are just two of her features. If you’re the type that can’t resist huge wins, you can try the Big Bet feature. If you activate the Big Bet feature, your stake is a group of five spins. When you pick the 10 credit bet, you have a chance to get mega expanding wilds. The bets can go all the way up to 25. The next time you play Rainbow Riches slots, you should definitely give this spin-off game a try. Rainbow Riches Reels of Gold slots game offers a lot of bonuses for your coins. The highest you can get in the base game is 500x, when you get five leprechaun symbols. Another refreshing twist is you can bet your free spins. If you succeed, you can get up to 100 free spins in one game.